We have discovered by using our method that the history of ancient Egypt stretches out over a period of at least 350,000 years. This is not just a wild guess. We can claim this with a certainty of over 99.998%. This means that all theories, even the theories presented by the so-called “controversial researchers” regarding ancient Egypt are nothing more than fanciful assumptions and fairy tales. Fig. 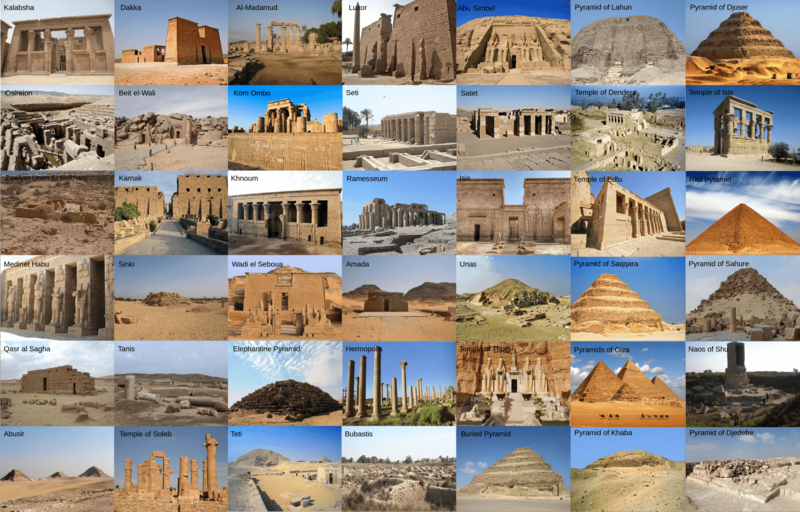 1: Here we show a selection of the ancient Egyptian sites that we used in our research regarding the true age of ancient Egypt and the giant monuments you see at the Giza plateau are just some of these. In total, we have measured and processed 59 sites of Ancient Egypt, which is just 10% of our large database that contains the data of many hundred ancient monuments from all over the world. Ancient Egypt is much older than a few thousand years. In fact, most of ancient Egypt is older than 100,000 years. Giza belongs to the youngest monuments of ancient Egypt. They represent the peak accomplishments of a civilization that reverted back into darkness. | © Mario Buildreps 2015-2018. The great pyramids at Giza and the great Sphinx are in fact among the youngest ancient monuments of the many ancient monuments that we can still find in Egypt. By using our method, we can position ancient monuments into five timeframes. Giza cannot be older than 26,000 years. This is where the limit lies of any controversial dating regarding these pyramids. And, by the way, they were not built by aliens as some people believe. This kind of conjecture is caused by the rigid linearly paradigm they are caught in that does not allow an elevation of Homo sapiens to a species with quasi-godlike abilities. By dragging aliens unto the scene, they hope to solve the many mysteries, not realizing that an even greater mystery is thereby introduced. In fact, things get much more convoluted. With our method we have proven there are much older monuments than the well-known Egyptian pyramids all over the planet. Some are incredibly old, and some are even older than 300,000 years. Most people focus on the great pyramids at Giza and think that these are the oldest pyramidal structures on this earth. A little thinking and a little reading (here) would quickly change their minds. Some researchers even believe that the Sphinx could be some 800,000 years old. If that were true, it would have been at least 3° to 5° counterclockwise oriented due to the rotation of the African plate over that time period according to the current satellite data. The Sphinx is perfectly cardinally oriented, and therefore it cannot be older than 26,000 years. It is not difficult to see that Academia’s usual approach to date the Sphinx with their dubious methods is profoundly incorrect. The Sphinx, as we see it above ground level on the Giza plateau, is not older than 26,000 years. Together with the pyramids, it belongs to the youngest ancient monuments on Earth, whether we like that conclusion or not. As the monuments on the Giza plateau are perfectly cardinally oriented, they are very young compared to 90% percent of the other ancient monuments that are scattered around the Earth. Incredibly tall structures are not built at the start and then followed by smaller ones. Projects start small and then grow bigger and bigger as experience is gained. People learn slowly how to build larger and larger because large projects are intensely complicated. This also applies to The Great Pyramid of Giza (also known as the Pyramid of Khufu or the Pyramid of Cheops). It is one of the last structures this long-lasting, lost civilization had built before it collapsed. Fig. 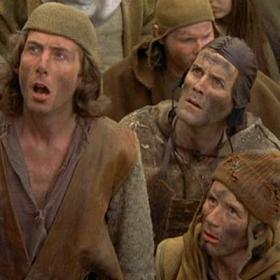 2: Today, we have much more in common with the superstitious medieval serfs than we have with the Satya Yuga Humans. This is further explained below. The lower developed cultures that followed, like that of the pharaoh dynasties (Akhenaten, Khufu, Ramses, Tutankhamun) claimed the tall pyramids as one of their own achievements, and anyone who contested such a claim risked decapitation. The fact remains that these pharaohs were not the original builders of the many major monuments we can still find in Egypt. We see the same pattern repeating all around the world. Megalomaniac rulers took ownership of the ancient megastructures, polished them up, sometimes even leaving marks on them that we would now call graffiti. But the truth is that these megaliths already existed. They were built millennia earlier by one of the lost civilizations. We see similar behavior in China, in Myanmar, in Latin America. It is in the nature of low developed barbarian cultures to claim the works of high developed predecessors in order to impress the masses. Official records were destroyed and replaced by false ones. Kings ruled with fear and seemingly great achievements. This behavior changes very slowly when the awareness of the population grows and they start to think for themselves. Fig. 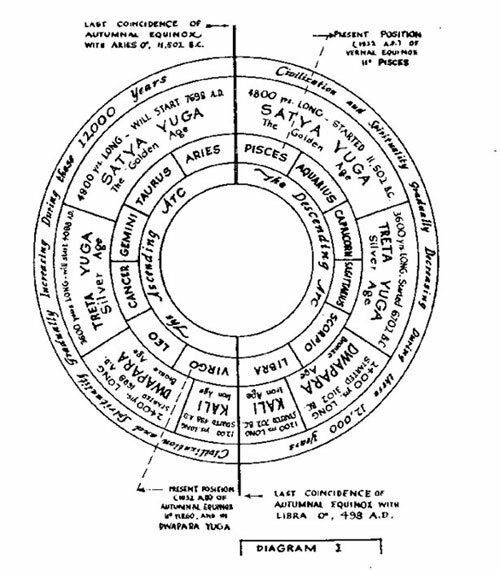 3: This diagram from the book of Yukteswar shows how the Yuga cycles have to be interpreted. The direction runs clockwise and makes one cycle every 24,000 years. It could be that with our growing understanding of the equinoxes that the cycle needs some adjustment to somewhere between 25,000 and 26,000 years. But that has only little impact on the big picture. Yukteswar did magnificent work to paint a bigger picture of Human consciousness through the eons. Civilizations do not develop according to a simple linear progression as historians want you to believe. According to ancient Indian teachings, principally the Mahabharata, consciousness follows a cyclic growth and decline pattern of roughly 24,000 years called the Yugas (ages). This is the period of one complete orbit around the ecliptic. Each Yuga cycle is of ~12,000 years duration, comprised of four Yugas of equal duration of 2,700 years each, flanked by transitional periods of 300 years (150 years descending and 150 years ascending). The complete Yuga Cycle of ~24,000 years is comprised of an ascending and a descending major Yuga cycle, repeating sequentially for eternity like the hands of a clock. For the past 2,700 years (700 BC – 1,700 AD) Humanity has been evolving through the dark Kali Yuga (see Fig. 3) and has entered the very beginning of the ascending portion of the “Bronze age”, of the Dwapara Yuga. The Dwapara Yuga is fundamentally different from the Kali Yuga in its spiritual and material dimensions, hence we see a profusion of technological achievements and a yearning on the part of Humanity for more meaningful spiritual qualities of life. Such a period is also punctuated by far-reaching changes in our environment, as we transition to this period of enhanced consciousness. The current increase in tectonic activities and the higher incidence of extreme weather phenomena may be indicative of the fact that we are slowly entering into a period of active earth changes. The Great Pyramid of Giza is the crown achievement of a civilization that lasted for many millennia and peaked when they finished this giant monument. It is an example of godlike ingenuity, built by Homo sapiens with a much higher consciousness and intelligence than ours today. You might wonder: how is that possible? There is not one theory out there that can fully explain how The Great Pyramid of Giza was built and what its purpose was. We can only guess and that has to do with our current relatively low degree of spiritual virtues and mental development. It will still take many centuries before science fully understands how matter is formed and transformed by vibratory action. Giza was built during the last highest Yuga and therefore is it impossible for Humans like us, with our present limited moral virtues and intellectual capabilities, to understand what Giza was precisely used for, no matter how hard we study, research and think. The full purpose of Giza and many of the other ancient monuments will only be understood very gradually as Humanity progresses in consciousness over the next several millennia. Humanity will enter the highest Yuga, Satya Yuga or the Golden Age, in about 6,000 years from now. We are currently much closer to the level of primitive medieval Humans than we are to the level of godlike Satya Yuga Humans that we are destined to once more attain. The current official understanding of humanity’s ancient history could not be more incorrect. As long as well-funded research institutes are not doing their work properly, Humanity will remain in the dark regarding their real origin and their real capacities for multiple centuries to come. Fig. 4: the above diagram shows the Yuga cycles, as taught by Sri Yukteswar Giri in his book “The Holy Science”. We have found multiple clues that Giza (Khufu) was built most probably around 15,500 years ago during the rising Satya Yuga by Homo sapiens with godlike capacities. When we say “godlike”, we mean in terms of consciousness development. Note the enormous gap between people in high Yugas compared to our current state of consciousness today. It is easy to understand why we cannot comprehend many of the things our ancient ancestors had built and achieved. We understand barbarians much easier than we understand godlike people, and that is one of the reasons why big media thrives on violent movies and events. It is also easy to understand why ancient Egypt fell into darkness, because, after Giza was built, the Yugas went down rapidly pulling a high civilization into inexorable decay. In Dwapara Yuga (the blue area between 700BC and 3,100BC) the alleged builders of Giza did not understand one iota of the tall monuments and how they were used. They claimed it as their own achievement in the falsified records and even called it their “tomb”. | © Mario Buildreps 2015-2018. Why is our world currently ruled by only a few power-hungry individuals? Part of this answer can be found in some Gnostic teachings. The high priest order in ancient Egypt possessed secret knowledge and secret techniques to guide energy. The original knowledge was passed on from the preceding Satya Yuga but could not be fully understood by the high priest order of the succeeding Tetra Yuga and Dwapara Yuga. Some among the high priest order thought it was necessary to draw all the power to themselves by turning the knowledge not for the benefit of all but for the benefit of a few. The ruling class turned away from “Service to others” to “Service to self”. One of these high priests was Moses. The power of Moses’ ancestors still rules the Earth today through the heritage of the Levites, i.e. secret networks, secret knowledge, secret rituals, a global trade system, and of course a banking system. This power, divided into several upwardly sealed compartments, is used to suppress and subjugate the masses. Because the Yugas are invariably raising the awareness of the global population, they will rise in consciousness as well and within a few centuries from now they will overcome the control and surpass the knowledge of the few rulers. Within the prevalent Kali Yuga and exposed to a few entities bent on taking over global power, the Earth has become a place of fear, dissension, jealousy, and greed, and by doing so, the few can easily rule over the divided masses. However, when enough people wake up, and that means at least 10% of the world population, and when they will see through the web of lies, the dark game of the Elite will be over. Humanity is destined to slowly re-enter an era of light. It is crucial to understand that the system we are living in today is still the heritage of many millennia ago. Our ancient history is not just a few thousand years old. That is false and is one of the crucial paradigms which is solidly put into place by the Powers-that-be – but not for long! Ancient Egypt is a prime example of the gradual rise and fall of consciousness of a whole world population over hundreds of thousands of years. Because we use mathematics for dating the monuments, we have high certainties of being correct. High certainties come with downsides. One of them is that the method has limitations in age range. Of course, we are as eager as anyone to look further back in time but when we do this our method becomes ambiguous and therefore more likely to be incorrect. That means our method cannot reliably look back further than 350,000 years. That counts for ancient Egypt as well. We suspect that the oldest foundations in ancient Egypt are almost an incredible one million years old. But we cannot prove this. We can only prove the antiquity of ancient Egypt up to an age of 350,000 years and the rest is out of range. Fig. 5: When we look at this graph, we see that the orientations are scattered in all directions. A few observations are easy. 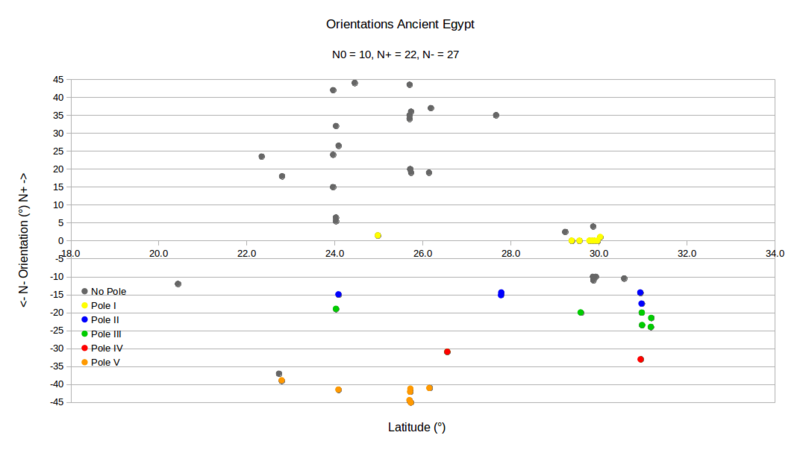 Most orientations around 30° latitude are cardinally or negative. The positive orientations around 24° latitude follow a distinct pattern. We see that the negative orientations (27) outnumber the positive orientations (22). The reason for this is age – with 91.1% certainty. Most of the positively oriented monuments are out of the range of our method and many of them are with a high degree of certainty much older than 350,000 years. | © Mario Buildreps 2015-2018. Fig. 6: The graphical representation of the underlying data. The relation between ancient Egypt and the full range of the 5 ancient poles is with 1 to 82,300 regarded as fully proven. The age of Egypt’s monuments stretches out over a period of at least 350,000 years. | © Mario Buildreps 2015-2018. We have explained that the positively oriented monuments cannot be dated because they do not seem to relate to one of the proven geographic Poles I to V. They count however in the probability calculations, and because they do so, they heavily suppress the probability that we could be correct with our method. So, what did we find? It appears that 21 of the 27 negatively oriented monuments (77.8%) relate to one of the Poles II to V. The area that these poles cover is only 36.4% of the possible space of freedom. Every mathematician immediately understands the consequences of this seemingly random ordered pattern. There is only 0.00122% chance (1 to 82,300) for such a pattern to be coincidental. That is why and how we know that these ancient monuments are as old as the poles to which they pointed. We immediately see that our proven poles again relate to this group of ancient monuments and they also do so in Egypt. The least persuasive relation is with Pole IV. This can have multiple reasons for which the destruction of a certain group of temples is the most likely one. For most of us, it is easy to understand that the ancient monuments that we find today in Egypt are just a tiny selection of this once thriving culture over a very long period of time: 350,000 years, or more. Homo sapiens has been wandering around on Earth for more than 420,000 years and was apparently very active, similar to our predecessor Homo erectus. The mistake science constantly makes is to assume that Homo sapiens built nothing and did nothing over more than 400,000 years and suddenly started to be very active. 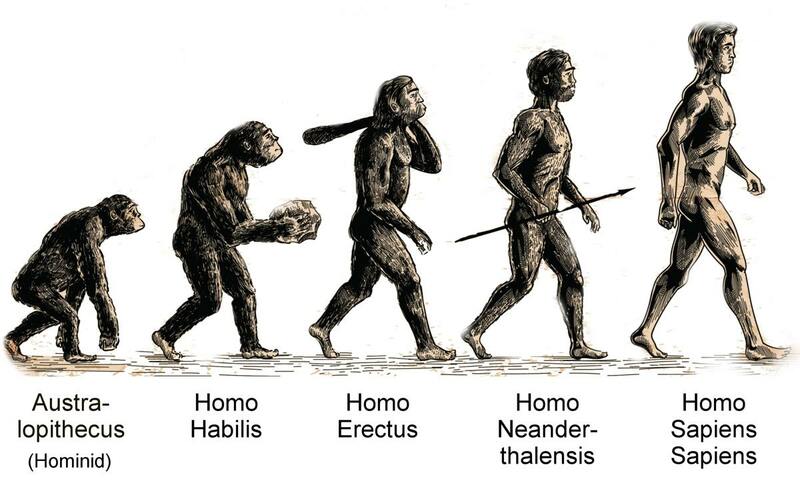 Academia depicts Homo erectus as a stupid ape-man like creature. Nothing is more untrue. The fact is that Homo sapiens was constructing all sorts of megalithic buildings from the time they first appeared on the scene. 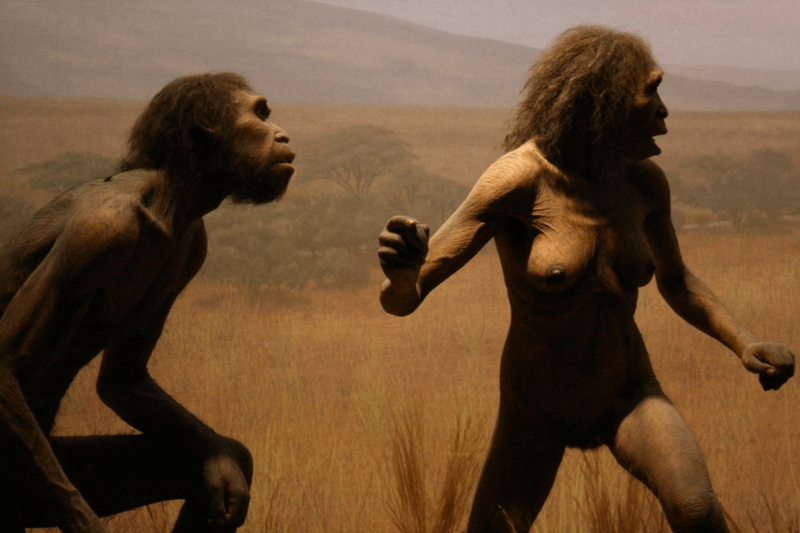 It seems that they learned a few things from Homo erectus. Fig. 7: This is how science currently depicts the Human evolution. It will probably change every few decades. There is in fact very little known about these species. Smaller brain size does not mean a species is less smart. What in general counts for intelligence is the ratio between body weight and brain size, which is about 51 to 1 for Homo sapiens and 45 to 1 for Homo erectus, making the specs for Homo erectus slightly better. From Australopithecus on the left, to Homo erectus in the middle, to Homo sapiens on the right. It is believed there was some intermediate species between erectus and sapiens. Some call the species Cro magnon and others Neanderthal. There is a lot of discussion going on about this intermediate species because it was present along with Homo sapiens. Neanderthals had about 10% larger brains but since it was an incredibly robust built species, their weight was about 30% higher making their ratio between body weight and brain size worse than that of Homo sapiens. Neanderthal was probably less witty and prescient than Homo sapiens which are powerful survival properties. What About the Other Monuments? Fig. 8: Science depicts Homo erectus as a retarded ape-man and that appears to be a big mistake. Homo erectus was a skilled builder and constructed many of the very ancient monuments that we can find in ancient Egypt – but only temples. We can conclude from our data that Homo erectus built no pyramids. During high Yugas, Homo erectus was a more skilled builder than Homo sapiens during low Yugas. We still have a list of buildings which cannot be dated with our method. They are out of range so to speak. It is very likely that they are between 400,000 and 600,000 years old. But we cannot prove this age with our data. That is one of the downsides of an unambiguous mathematical system. The monuments that cannot be dated are probably much older than 400,000 years. One thing is clear though; there is not one single pyramid among them. Only temples between latitude 24 and 28 degrees and that is a distinct pattern. Homo sapiens started to built pyramids for specific energetic purposes around the 30th degree of latitude. Something that our predecessor, Homo erectus, seemingly had no need for. The existence of the temple of Luxor, for example, stretches out over a long period of time and was renovated and extended multiple times by two successive human species. That idea is something not many people can comprehend due to their deep and flawed programming regarding our ancient history. The massive structures, built with very large megaliths and with eerie precision, were built by Homo sapiens during one of the high Yugas, namely Satya Yugas. Only in such an era are we, as a species, able to understand and manipulate all forms of energy. With our technical devices and technical know-how, we tend to believe that we are an advanced race. But the truth is that we are “light years” away from the magnificent godlike Homo sapiens that built the great pyramid of Giza. To reach that level of competency will still take some 6,000 years of consciousness development. That is why we presently have much more in common with superstitious medieval serfs than with our ancient ancestors who built the many magnificent structures in ancient Egypt many millennia ago.